Mindfulness. It's a bit of a buzzword these days, and it's no wonder why. In a world with so much activity and sensory input (have you seen the blaring TV monitors at the gas station?? ), we all hunger for ways to feel grounded, for touchstones that we can go back to throughout our busy, screen-filled days. It can be a real challenge to stay present in any given moment when so much is competing for our attention. Take, for example, this working mother of three who too often finds herself responding to frantic work e-mails on her iphone while attempting to feed three children and clean the kitchen. I am the world's best multi-tasker--I have to be with so many responsibilities and people depending upon me. It's the mono-tasking that I'm not so good at. These days I try more often to put the phone down, let the dishes be dirty, and enjoy the lip-smacking sounds of my babies discovering a pluot for the first time. Finding the space to pause in those seemingly insignificant moments transforms them into opportunities for connection, both with those around us and with ourselves. The challenge lies in creating that space, and the more that we have on our metaphorical plates, the harder it can be. Perhaps that is why my heart broke a little when I read this Times article about how "nudge" marketing is being used to guide supermarket shoppers toward the produce section. It's a fascinating article examining how social scientists are using "gentle" tactics to get people to make healthier choices as they shop. No preaching or judging, just some subtle coaxing. It's genius, really: a divided shopping cart with instructions to use the front half for fruits and vegetables, or giant green arrows forging a path to the produce section...the tactics are so simple and easy (and cheap) to implement. But it was the mirror trick that really got me. A grocery store in El Paso placed mirrors at the front of their shopping carts in an attempt to compete with the flashy, junk food based displays that surround shoppers as soon as they set foot in the store. "'I'm looking at myself, and thinking, O.K., now what?'" said Samuel Polido, a shopper featured in the article. While the effectiveness of the mirrors has not yet been fully studied, that aha moment says so much about the way that so many of us relate to food in this country, and how so much of it is out of our control. Bombarded by advertising and grocery displays that push us toward items whose real food value is questionable at best, we forget how important it is to care for ourselves through the choices we make. We have the power to buy and prepare food that supports the health of our bodies, our families, and our communities, but these days that can be so hard to remember. With time, perhaps more grocery stores will implement tactics like the ones included in the article. Until then, here are some strategies I use to stay mindful about my food, both when I'm shopping and when I'm in the kitchen. Bring your own bags. Sounds simple, but by taking a moment to grab your totes on your way out you are already beginning with mindfulness. You set an intention to shop in a thoughtful way that is good the planet and for your community. Shop the farmers' market first. In season, it can be incredibly economical, and in the winter you can treat yourself to a few fresh, local items. You get sunlight instead of florescent ones, fresh food instead of processed, and community rather than commodities. Once you have your market finds, you can figure out what else you need to round out a week of meals that are grounded in whole, healthy, local foods. Stick to the perimeter. Almost all grocery stores stock their fresh food items on the outside--whether it's produce, dairy, meat, or seafood, you will find it all if you just make a lap around the store. Yes, you may need to dip into the aisles for bread, pasta, and a few other basics, but the more you can avoid the interior the more likely you are to walk out with a cart full of real, healthy food. Cook big. Stewing up some lentils and kale? Chopping peppers and carrots for a pasta salad? Whatever you're cooking, double or triple the quantity and stash the leftovers in the fridge. There's an easy meal for next few times you need it. Keep it simple. There's no shame in carrot sticks. In fact, there's no shame in carrots that have not even been chopped if you need a quick snack or a side of veg. You can also slice them and throw them in a roasting pan with a little olive oil if you have an extra ten minutes to prep and a half hour to let them cook (at 350, covered with foil). Either way, don't be fooled into thinking that a microwave dinner is really that much easier than preparing your own. When you're really in a bind, just go basic and you can't go wrong. Consult your cookbooks before you shop (or don't). In other words, learn how you most enjoy to be in your kitchen. I get impatient with recipes and have the most fun when I'm improvising with whatever I have on hand. But I have friends who love to work their way through cookbooks and produce elaborate dishes. Figure out what most inspires you and then develop a shopping approach to match. Grow Your Own. This year, with a backyard redo and so many babies, we had to put our glorious garden plans on hold. But, we did manage to get a couple of basil plants going. It's so lovely to walk out back and just pick what we need, and gardening makes a great summer project for the littles. 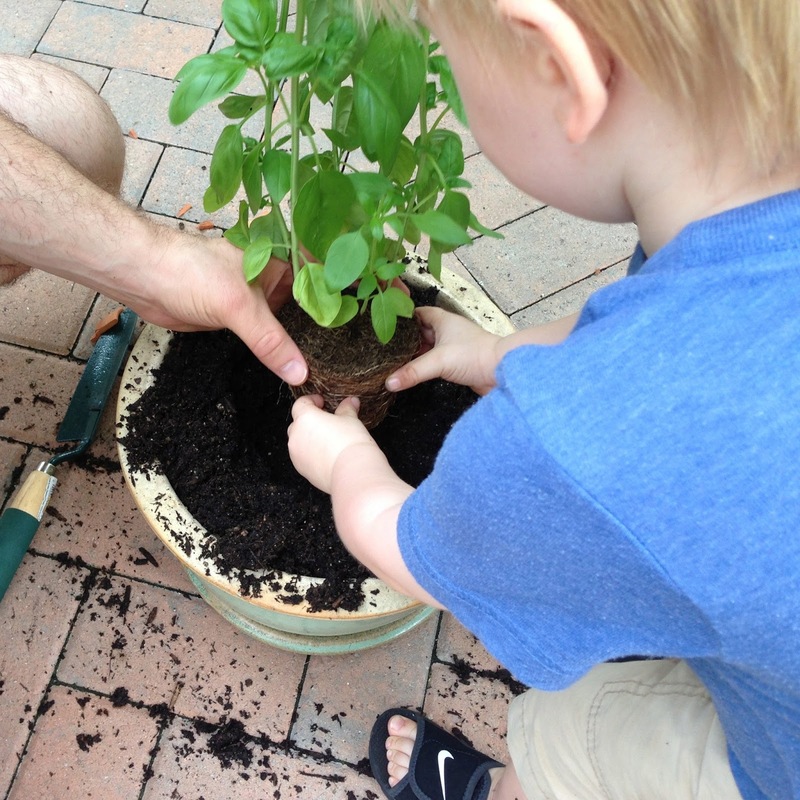 Our toddler helped to plant our basils (as pictured) and is now in charge of watering. Mostly though, he enjoys the work of eating it! Keep looking in that mirror, metaphorically speaking. In the absence of a mirrored shopping cart, remind yourself whenever you can that what you eat and how you prepare it can provide a wonderful way to nurture yourself, your friends, your family, your community, and your planet. Every day is filled with opportunities to choose fresh food over frozen, the dining table over the television, whole foods over processed. Yes, there will always be nights when we just want a pizza to appear at the door, but the more you can nudge yourself toward eating and cooking with mindfulness, the easier and more enjoyable it gets. What are your favorite strategies for staying mindful in the kitchen?